Urban Logging - a new adventure! It's long been a dream of mine to start urban logging and about four weeks ago that dream became a reality! For those that don't know, urban logging is the salvage of trees from urban environments due to storm damage, construction, and tree disease or death. Salvaging trees after removal prevents the logs from being thrown away in the landfill or turned into firewood and mulch, allowing me to secure one of a kind pieces for extremely unique furniture. My start into urban logging began with the opportunity to salvage and mill two trees in the Austin area: a Live Oak tree in North Austin and a Pecan tree on the East side. Live Oak is considered by many to be the pride and joy of central Texas, due to its unique arching branches that spread outward and rest on the ground! This specific Live Oak tree was cataloged and registered as a Heritage tree of Austin due to it's age and size. The tree had sadly been dead for a few years and needed to be removed from the property. Understanding the beauty and value of this tree the homeowner put an ad on Craigslist in hopes the cut logs would be saved from the landfill or being cut into firewood. I responded to that ad and coordinated with a local sawmill to cut these logs into useable slabs. The process was amazing! I was immediately hooked on the urban logging philosophy and wanted an economical way to start milling myself. After researching different milling options I bought an Alaskan sawmill and Stihl chainsaw to have my own portable mill. Shortly after getting my sawmill, I was contacted about a dead Pecan tree cut down in East Austin. Pecan is the state tree of Texas and an often sought after wood option for many locals. 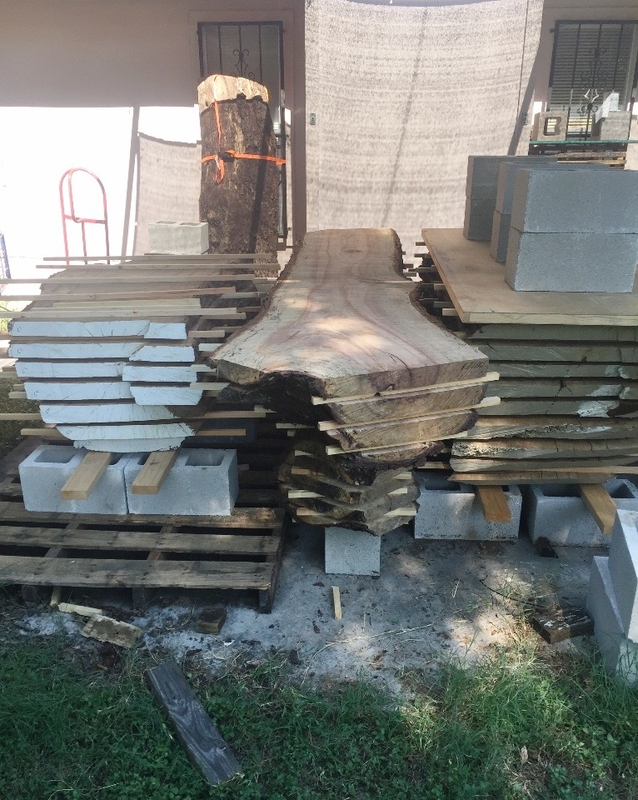 I was happy to take my new chainsaw and Alaskan sawmill to the tree and start cutting it into slabs. For my first time milling, the process was more physical and time consuming than I expected. But I loved every minute and cannot wait to use the slabs I salvaged! The philosophy of urban logging is a slow-play, long-term investment that will in time be extremely beneficial not only to myself but to the clients who will give these trees new life in their homes for years to come. I want to do my part to salvage as many trees as I can to prevent them from being thrown away and highlight their beauty in pieces of furniture. To see more photos and videos my recent milling process, visit this post! These beautiful pieces were delivered to their new home a few weeks ago and are already being well loved! The desk has a live edge solid Walnut top with a cantilever Walnut base. The entry table has a 2" thick live edge Cherry top with a welded steel frame and Cherry shelf. Keep up with our latest projects. Follow us on social media! Support local. Recommend us to family and friends! Posted on November 10, 2016 by Dane Gudde and tagged urban logging lumber milling pecan walnut desk cherry entry. Custom Made Furniture in 2018? Why Is Custom Made Furniture More Expensive? Is Custom Furniture Right For You? If it isn't made to outlast the maker, it's not worth buying.